The beer turned out wonderful. 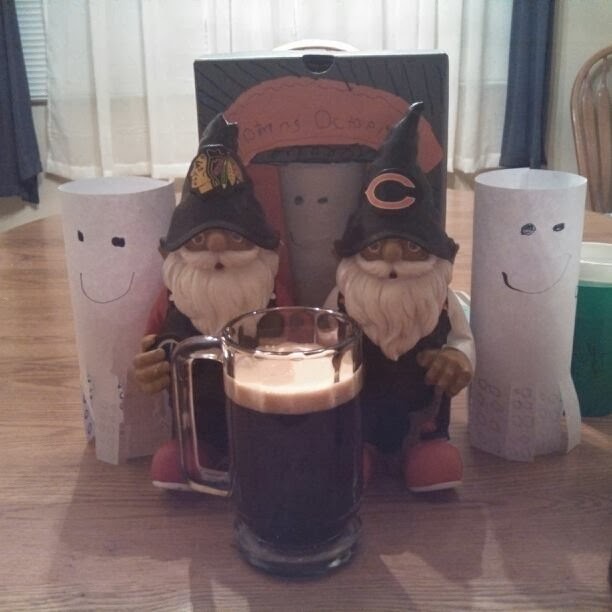 It did turn out darker in color than I associate with an ESB, and the Gnome and I decided we needed to fix that in the recipe next time we brewed it. This year's birthday was at the beginning of the month, and my family got me another Gnome. This one is a Chicago-Bears-wearing creature that is named Gnaughty. 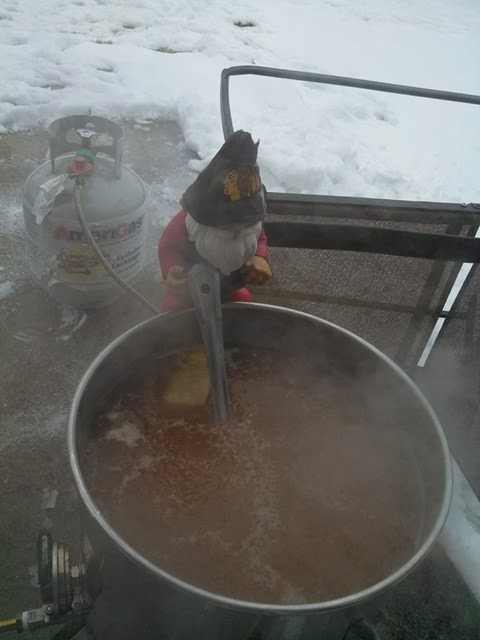 He has not had a chance to do much brewing, but he was up to help out on the next time we brewed. That next time was last Sunday. Sorry I am slacking so bad on getting this post out, but it is better than I did for SWMBO last time. We did not get started as early as we have most times lately. 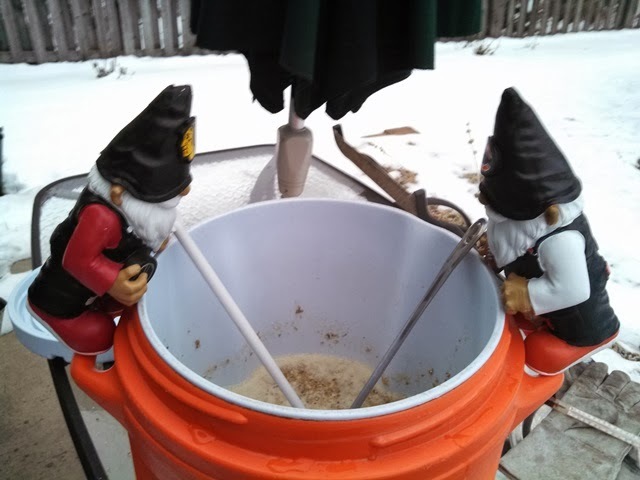 We didn't really feel like getting up at a ridiculously early time, plus last time we brewed Gnasty the Gnome ESB, we let the mash go through church. We thought we should keep the procedure as close as possible as last time. Just like last time, we had quite a bit of water salt additions. The water for Gnasty the Gnome ESB is not quite what you would call "burtanized", but it does contain more water modification than any of my other beer recipes. Just like last time, we put half the salts in with the mash and the rest into the sparge water. For what it is worth, most of the time I do water additions, I put it all in the mash. 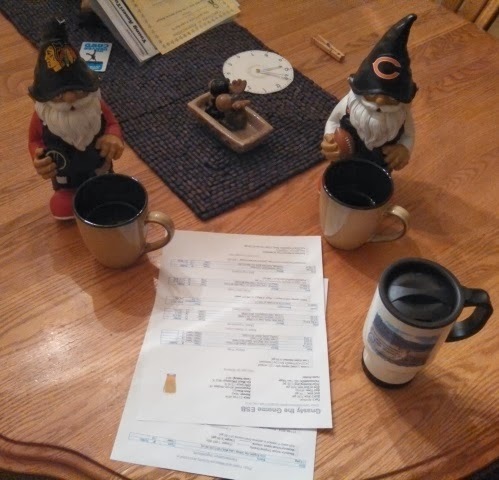 Reviewing the recipe with our cups of coffee. Anyway, the mash went fine. We did mash in a little higher than we had planned. The temperature was right around 154 whereas we had planned for 152. We decided that was ok. Other than stirring a bit longer with the top off, we didn't try to reduce that temperature. As I mentioned above, we let the mash go all the way through church. So, the mash was about 2 and a half hours. The recipe says to mash for 60 minutes. To be honest, I almost always let my mash go longer than what the recipe says. By the time the mash was done, the temperature was a bit lower than 150. I think that is pretty good for such a long mash on such a really cold day. Gnasty the Gnome ESB does not include a traditional hop bittering addition. Instead, we use first-wort-hops. It does extract bitterness, but those who favor first-wort-hopping (including myself and Gnasty) say it is a less harsh bitterness that seems to hold onto some of the hop flavor and aroma as well. I do use the technique quite a bit. The boil, as always, was a 90 minute boil. I thought I was going to run out of propane, but as it turned out, the propane made it through the whole boil. Actually, it completely cut out right at the end of the boil. literally less than a minute from the end. That was awesome. There were times when I came out and shook the propane tank to get it flow going stronger. I thought that with the low tank, the evaporation would not be what I wanted, but my gravity ended up where I wanted it. 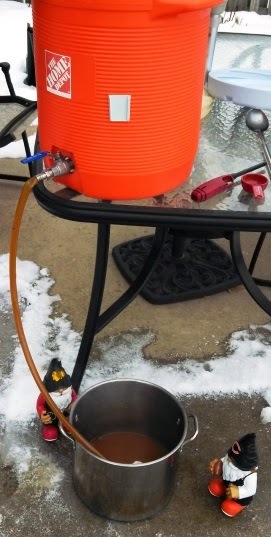 I chilled the wort, and let it sit in the cold to let the cold break settle a bit. 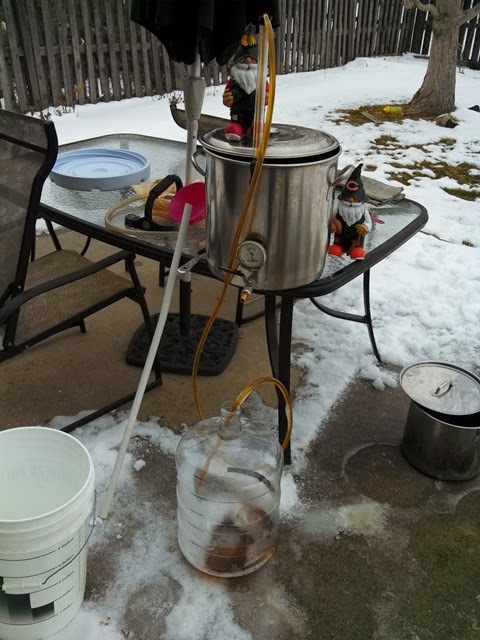 By the time we got the wort into the carboy, the temperature was 58 or so. After that, I let the carboy warm up a bit before pitching the yeast, which had been harvested from the last time I brewed SWMBO. And so, everything went very well. The beer fermented this past week. I think I am going to move it to secondary with dry-hops today. I'll also harvest this yeast for my world-famous Pompously Illegitimate Red Ale, which I think will be one of my next beers. 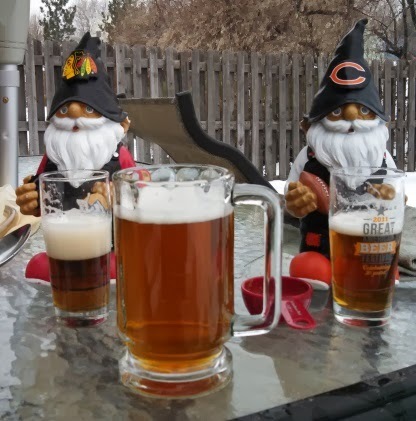 Gnasty, Gnaughty, and I will be sure to let you know how this batch of Gnasty the Gnome ESB turns out. 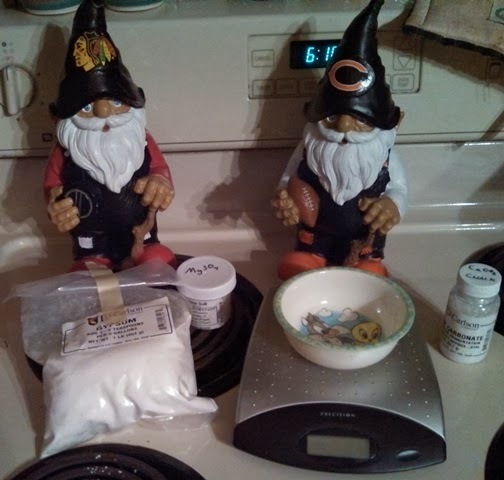 Those gnomes really know how to get down! I wish I had some brewing assistants like them. It seems like they love a generous pour, also. I hope the changes work to get it where you wanted it.